So we escaped Ahmedabad, and got on our sleeper train. We were in a compartment with a sweet family, who got us to talk to their daughter on the phone, and invited us to their village, which we declined! The sleeper beds were hard and as soon as the train was going it became freezing inside. Everyone on the train seemed to be very ill too. We arrived into Udaipur and the hostel had sent a driver to pick is up which was amazing. The hostel itself was a beautiful blue and pink place up a small hill, with amazing views across Udaipur! We didn't do much the first day we went to a temple in the center of town. The second day we hired a rickshaw driver for the day for 600 rupees, so about £6! He took us to loads of interesting places. 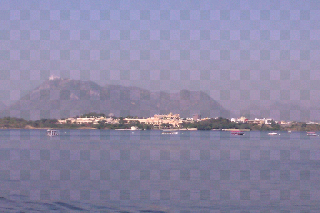 First he took us to lake Pichola, which was beautiful, and we got the boat ride around it, the lake is huge and has 2 hotels on it, and is surrounded by mountains! He then took us to a local market. We then went to a royal cremation ground. 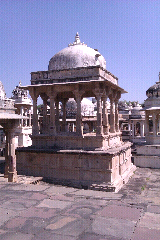 It was full of beautiful cenotaphs, all different for different royals. It was a huge place. Now we were the only ones there, and our driver said to pay on the way out, he said he might be able to get the price down. But the guy we paid was a secruity guard and he made us go behind a wall to pay him, so I guess we weren't actually alowed in there and we just paid a bribe to get in! After this we went to a Hindu funeral ground which was very peaceful. We then went to sahelion ki bari, which is gardens with beautiful fountains. We also went to a tailor and I got a salwar kameez top made, which is beautiful. That evening me and Andy met Raj, my Uncle Philips friend. We had an amazing time. He picked us up on his motorbike (3 of us on the motorbike, abit of a squeeze!) And we went to the hotel he's the manager of, which was over looking the lake! We had lovely conversation. The next day we went to city palace, we just went round the museum bit, it was quite beautful in parts, with stained glass Windows, and rooms full of mirrors. And there were a few beautiful courtyards. The best bit was a courtyard that was embellished with 3 mosaic peacocks, which was just stunning. The tour got abit thin towards the end, and they had a lot of paintings which didn't really interest me! We then went over to Raj's house and had a lovely home cooked meal with him and his wife Suchi. It was all delcious, but I had started go come down with a fever, so couldn't eat much, and I spent the evening very ill in bed. We hired the same rickshaw driver the next day and went out of the city and saw some temples, and we then saw a dance and puppet show in the evening. 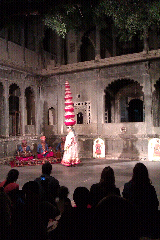 The dancing was very good, all traditional dances, one girl danced with a pot of fire on her head! We then changed from our hostel to a hotel for some luxery. The reason we picked the Anjani hotel was that.it had a swimming pool. But when we got in it was FREEZING! So didn't spend ages in there. I was feeling abit sick, so spent most of the day relaxing in room. We then went up to the roof top terrace to take pictures of the sun set. I started to be violently sick over the side of our nice hotels balcony, luckily Noone else was around! 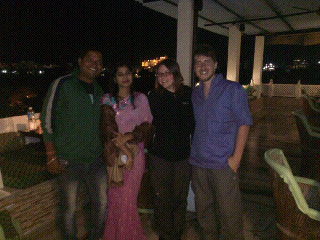 We then met up with Raj and Suchi in the evening which was lovely. Sounds like you enjoyed Udaipur as much as I did. Wonder if you went to the same Tailor as I did? I met m first elephant outside that shop and got to stroke its trunk. weird but lovely sensation.